“No, Mr. Bond, I expect you to die!” – It’s one of the most famous lines, not only in Bond history, but also in movie history. 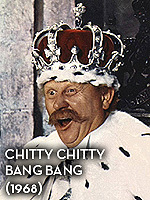 They were, of course, spoken by Auric Goldfinger, the man with the Midas touch, played by German actor Gert Fröbe. But the golden words he poured in our ears weren’t his own. Even though Michael Collins did a great dubbing job, the fact that Gert Fröbe’s own voice can’t be heard in “Goldfinger” may be considered one of the great missed opportunities in Bond history. But it wasn’t meant to be. Fröbe’s English was so bad, the producers even had to hire Nikki van der Zyl (who would later dub Shirley Eaton in the movie) as a voice coach to make sure he would at least make the correct mouth movements. 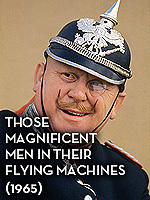 But as a side effect of this, his English became good enough to be used in later movies like “Those Magnificent Men in their Flying Machines” and of course as Baron Bomburst in “Chitty Chitty Bang Bang”. 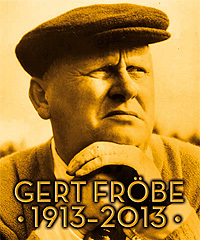 Gert Fröbe was born 100 years ago, on 25th February 1913. Fröbe was born 1913 in the German town of Oberplanitz (which today is a part of Zwickau) in Saxonia. On his nineth birthday, he was given a violin, and from that day on, he wanted to be a violinist. At the end of the 1920s, during the Great Depression, his musical skills proved to be very useful. His father’s shop went bankrupt and Fröbe was able to earn a good deal of the family income, playing in bars and cafés as “The Red Fiddler from Zwickau”. Times were tough back then in the mining area around Zwickau. Like many young men of his time, Fröbe hoped that the new “National-Socialist German Workers Party” under their leader Adolf Hitler would bring some change for the better. 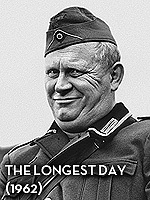 He joined the party in 1929, aged 16, and left it in 1937 – which was a brave thing to do at that time. While he was shooting “Is Paris Burning?” in 1965, he told this story to a reporter from the Daily Mail. A few days later, the Daily Mail ran the story under the bold headline “Of course I was a Nazi”, which lead to a ban of “Goldfinger” and other Fröbe movies in Israel. The ban lasted for eight weeks, until a jewish family from Austria came up, claiming that Fröbe saved their lives during his time in Vienna. But young Gert was not only a good musician, he was also a talented painter, which earned him an apprenticeship as a theatre painter in Dresden. While portraying famous actor Erich Ponto for a poster, he told him that he always wanted to be an actor himself. Ponto asked him to give a short performance of something, and Fröbe (who later reenacted this scene many times in interviews) gave his impression of Mephisto – totally overacting and with a strong Saxonian accent. “Forget about that,” Ponto said, “You’re not an actor, you’re a comedian.” But he saw Fröbe’s talent and agreed to give him acting lessons. After he finished his education, he played in theatres in Berlin, Wuppertal, Frankfurt and from 1940 to 1944 in Vienna. 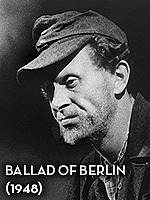 After the war he played in Munich, until he finally got his first movie role in “Ballad of Berlin” in 1948, in which he played a POW who just returned home. Many movie roles, large and small followed. French directors were especially fond of casting him as a bad guy. 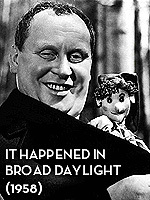 In 1958 he delivered a memorable performance as child murderer Schrott in “It Happened in Broad Daylight”. 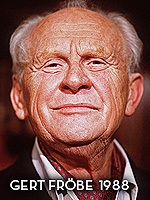 It was this performance that caught the Bond producer’s eyes when there were looking for someone to play the title role in “Goldfinger”, which was Fröbe’s start into an international career. While he was shooting “Monte Carlo or Bust” in 1969, his fourth wife died of cancer. Fröbe retired from acting for two years. After that, he first returned to his old love, the theatre. For the next 15 years, he would be constantly touring small clubs and theatres with solo performances, doing pantomime, stand-up comedy, recitations or simply telling stories from his life. But he was still in demand as a movie actor, even though the roles weren’t quite as big as before. 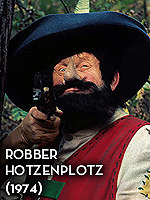 Among the many roles he played in that time, there’s one standout performance which made him an all time favourite with German children: “Robber Hotzenplotz”, the title role form a popular German childrens book. Fröbe had suffered from oral cancer since the mid-1980s, which, after many surgeries, he had finally overcome. He had done a recitation evening in a hospital in Munich where he was recovering. His fifth wife Karin was shocked when he later told her that he had a minor heart attack the same morning. She insisted that he’d spend the night at the hospital’s intense care unit, to which he agreed. The only thing he asked for was a TV set, as he wanted to watch a football match which was on that night. The next morning, it was the 5th December 1988, he had died in his sleep. 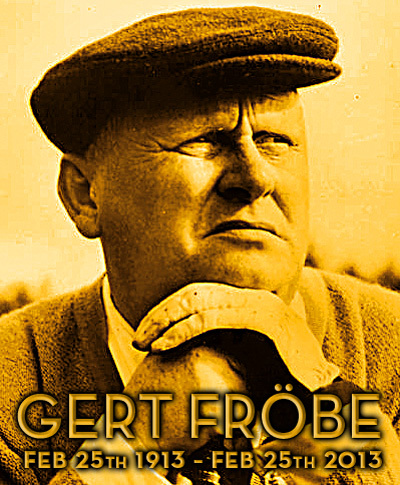 Through all the years until today, Gert Fröbe has always been one of Germany’s favourite actors, among children and grown-ups, mostly for his comedic roles. The rest of the world remembers him for the evil Mr. Goldfinger and other bad guy roles. But as they say, to be able play a great villain, an actor has to be a great comedian, first and foremost.